Welcome to our Commentary page, home to our articles on political and social issues, business and the economy, government, history and opinion. This fine article was an eye-opener for me. To many of us, it first seemed Gorsuch, though conservative, had a good record and “was the best we could get” under the circumstances. (1) FACTS: The company truck’s brakes were defective or improperly maintained. Brake lines “freeze” because there is water in the brake lines; brake fluid does not freeze. The company was negligent, possibly criminally so if they had been on trial. They were derelict in their responsibility and promise to provide help in a timely manner in freezing weather. They ignored the driver’s repeated calls for help and his statement that his legs were becoming numb and he was having trouble breathing – the truck cab heater was defective too, and he was almost out of gas. (2) Gorsuch ignored the responsibilities of the company in the matter, concentrating instead on what he presumed were the driver’s “duties.” Gorsuch ignored the health and safely of the driver. Every judge makes bad decisions, later to be regretted, but there’s an even more telling problem with this man. OUT OF ALL the considerations with which the law provides us, not least of which is following California Motor Vehicle statutes and protecting the health and safety of the driver and the public, Gorsuch focused on insubordination and dereliction of duty because the dispatcher ordered the driver to remain in the freezing truck. (4) In other words, like Scalia, here is another man who, under the textualism doctrine, cherry-picks his statutes in order to reach a verdict that is politically and personally pleasing to himself. CONCLUSION: Gorsuch is not qualified to be a judge, period. Until we get a fair-minded candidate who shows an ability to look at all the facts, prioritize them and evaluate them in the broader context of all US law, in order from trivial to essential, we should block GOP nominees for the ninth SCOTUS chair until Hell freezes over, if that’s what it takes to get a nominee committed to preserve and protect the Constitution and the individual rights of its citizens. Congress is finally perfecting a complete inversion of the popular idea of “Charity.” Billionaires and their huge corporations “donate” millions to our elected representatives. Like your $25 donation to your favorite charity, these millions are tax-exempt, meaning, of course, they’re taxpayer-subsidized. The resulting legislation effects a return of billions in completely legal and fully protected profits to the “donors,” a thousandfold return on investment (ROI). “Dark Money?” Like “Non-profit.” there we rediscover another grave euphemism. Taxpayers subsidize small investments in legislation, in the process best known as “graft,” which returns huge profits, which in turn are often sheltered under special tax sweetheart deals. In effect, we are paying corporations to corrupt the system for a profit. It’s become “Darth Vader” Money. Although 2014 was a signature year that will long be remembered for disgracing the Republican Party, I sniffed the sea change as early as twenty years ago – with the rise of Georgia Representative and Speaker of the House Newt Gingrich. With his ominous “Contract With America” and the longest government shutdown in our history, he signaled a new era of strident, intractable GOP politics which attracted, not the brightest and the best, but the opposite among both leaders and followers. Trump and Cruz were not the GOP sea change, they were its inevitable culmination. There were several factors leading to this unveiling of the very worst side of crony capitalism and hate politics, and Gingrich was hardly alone in leading the way down the hole. He bestowed traction and status to the worst elements in the party, and we can strongly associate the Gingrich Era with the instigation of most of the unsavory changes in the party, of which I’d been a supporter for decades. I occasionally post some “keeper” comments on Facebook, where they get swallowed up in the 18-hour Facebook Hole. I’m going to start sharing some of those here. I’ve always been fiscally conservative and socially liberal, and voted GOP until roughly the advent of Newt Gingrich and the ideological degeneration that followed. I still think free market capitalism could work fine if corporations and senators were subject to the same code of law as the rest of us., I grossly underestimated their willingness to do wrong, get away with it, and operate on the range of the moment gain instead of consequences for the long haul. I have many friends who describe themselves as conservatives but they mean the old school. I never expected the Democratic Party to have more to offer than my old party, but then I never anticipated a Trump, Cruz or David Duke either. I feel passionately about it and have thought about it for a long time. The big changes really started when LBJ signed the 1964 Civil Rights Act and hate politics bolted from the old Democratic Party to a new GOP I increasingly don’t recognize. I guess the difference is that some are capable of questioning their values or loyalties and making changes as necessary, and some on doing what they always did – and getting what they always got. Australian Aborigines found their way somehow to the most isolated continent on the planet, Australia, some 30,000 years ago, maybe more. Their culture and values didn’t change over the millennia because of their total isolation from other groups of humans, and they were under no pressure at all to learn, adapt or change. And they are a wonderful, generally very peaceful people. Change is the spice of life, Our job is to just try to make sure the direction is positive and brings more happiness, not less. The 2016 Presidential campaign has captured public involvement and commentary more so than any previous election year I can remember, possibly excepting the Goldwater vs. Johnson election year of 1964. Election Fever has spread to Facebook too, of course. A friend “Shared” an editorial essay by UC Berkeley political economist Robert Reich, which I’d say is recommended reading regardless of your preferred political party. I’d go further: our vote is often ignored and in some cases actually goes to the candidate your vote was meant to keep out, and it’s entirely legal. The system is rigged. A link to the Reich article is provided at the bottom of this post. After reading the article and pondering its implications, my thoughts over the past few weeks began to gel. I posted the following comment. Its intent is not in criticism of Reich but as expansion on one of Reich’s observations. I focused on our two-party apparatus as it has evolved in recent decades. A friend said they hope more folks read this. Very good summary and analysis. I’d go farther than labeling both parties as entrenched within the structure of the Establishment. Our parties have too much power. They’ve had it for a LONG time. I believe most of us were raised to view political parties as a means to allow us to organize effectively according to our political philosophies. The whole idea of “pre-committed super-delegates” is a slap in the face to the entire electoral process. So is the idea of “winner-take-all” states. We have the right to vote, but we don’t have the right to vote to cast out others’ ballots, and our elected representatives most certainly don’t either. Our parties insulate the electorate from the process with a firewall of lobbyists, corporate donations and interests, secret slush funds and an unwritten agenda of “business as usual.” Instead of the parties and elected partisan representatives being directly accountable to the electorate, the people are expected to fall into line with one or the other of the major parties’ rigged picks. Another sad case of the tail wagging the dog. Fox News, The National Review, and Rush Limbaugh all say The Khorasan group doesn’t exist. Most right wing commentators tell us this is further proof the Obama Administration lied, just to justify, Bush-style, the anti-ISIS air war over Iraq and Syria. I saw a Facebook newspaper scan purporting to be from a Canadian journalist, but I couldn’t find it again when I went back to look for it. It said and suggested the same thing. They’re pimping opinion from more respected sources. Even the Administration seems to be downplaying early claims US fighter planes severely crippled a “Khorasan Group” cell operating in the region. It seems a group, actually calling itself “Khorasan,” may not even exist. What further proof do we need, you say? Ask yourself first: what do we really know? None of the partisan news sources above have cited their sources, if they have any, or disclosed any documentation to substantiate their claims, on either side. So the attacks from the right and the antiwar left are speculative. No one doubts that Al Qaeda has attacked the United States before and would like to try it again. We also know there are hundreds of Al Qaeda splinter groups, including ISIS. ISIS was disowned because it refused to follow orders of the Al-Qaeda leader Ayman al Zawahir, currently trying to muster the parent group. “The Khorasan Region” may refer to an ancient historical area including Afghanistan, Iran, Turkmenistan and Pakistan, or to a military terrorist area of current interest in Syria. If Al Qaeda is operating a secret group in the Khorasan region – “DUH” – and if national or international security agencies have identified a specific threat, and that splinter group does not have a name, “Khorasan Group” would be a logical working name for US intelligence services to specifically identify that group of interest. But neither our security forces nor the US Administration can afford to reveal their sources without compromising intelligence “assets.” There will be no hard intelligence sources outside the intelligence community, and they cannot reveal that. I think everyone, left and right, understands that. I conclude no civilian sources have any bona-fide hard intelligence and aren’t likely to get any. The US intelligence services and top level Administration may have it, but they’re not likely to say so. Media hype, yes. Fox News and right-wing partisanship, yes. Any hit against Al Qaeda is a good hit. As for the rest of the hype, for the rest of us, we may never know. There are two key questions we need to answer before we can judge how man-made CO2 generation compares to well-observed effects of big volcanoes. “The Little Ice Age” was the first well-studied and documented rapid climate change, and it lasted about 300 years. It decimated Europe, and almost became an extinction event for struggling pioneer New England colonists. The Tambora volcanic event seems to have been involved. (1) How much of the Little Ice Age might have been caused by human activity, and how much by volcano? 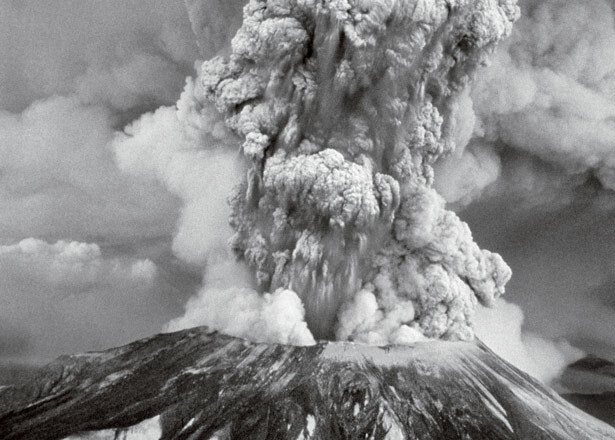 (2) If volcanic activity can change the weather, then at what point can we say for sure human activity may serve as a man-made replacement for extraordinary volcanism? In this article, we’ll compare the outputs of each phenomenon, and look into other components which have been fingered as contributing to climate change. Illustrated and referenced. 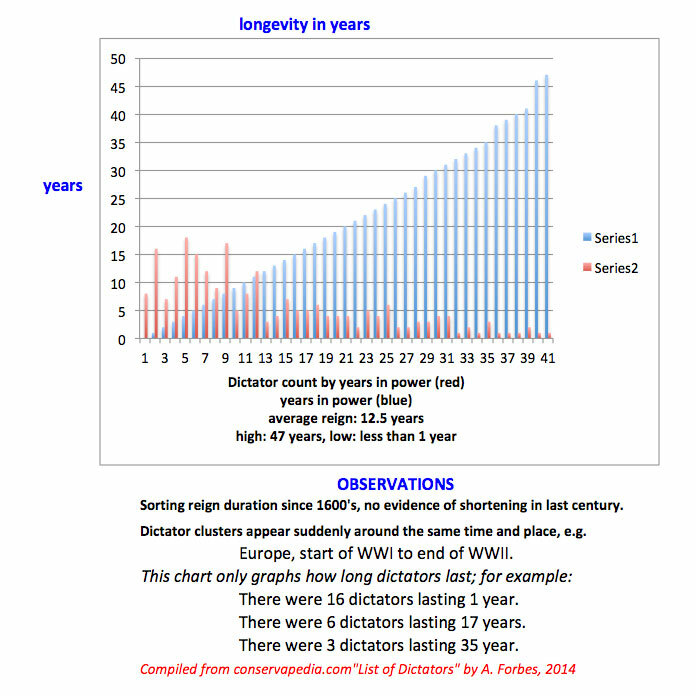 How Long Do Dictators Last? I was watching the news as the Taliban sweeps fledgling state Iraq, so recently “liberated” from the brutal dictator Saddam Hussein. Are they again to become a failed state due to their own religious factionalism, enslaved yet again by new opportunistic warlords? I soon realized, there IS a hair-splitting difference between a dictatorship and a totalitarian regime. Regimes, under a succession of dictators, such as the USSR, last under a century in modern times. And then we have “authoritarian regimes” in which some freedom is tolerated but rigidly monitored, all the way down to “benevolent dictatorships” and kingdoms such as Saudi Arabia, where the king is still head of state and nominally the final authority. China, once one of the bloodiest dictatorships after millennia of emperors and the indignity of the British Opium Wars, seems at the time to be a special case. North Korea, with its three generations of hereditary Kim Jongs, is almost universally held to be one of the most brutal and detestable regimes, with each generation of “Dear Leader” being crazier than its predecessor. And finally, we have that resurgent scourge of Huns, the terrorist armies, who, having seen territory they want, simply take them and execute the opposition. How long do dictatorships last, on an average? My guess for maximum longevity in recent times was about right. I did some research and analysis. Their website states “The following is a list of national leaders (heads of state and/or heads of government) commonly regarded as modern dictators.” The list is mind-boggling. Look at it. You can see some patterns that dovetail with what we remember of of history, but they don’t lend themselves to easy statistical analysis. What I liked was that their list included dates dictators were in power. I wanted durations of their reigns over time. What is their average, high and low reign as absolute ruler? Are there any patterns over time? Would it be fair to say dictatorships are today on the decline world-wide? I exported their web table to an Excel spreadsheet, calculated each dictatorship’s term in power, and I tried to do some simple analysis. I graphed the most significant result: dictatorships are almost always short-lived aberrations, though frequently followed by new aberrations. I could see no particular evidence they are on the wane; what changes is where and when they sprout, like poison mushrooms after a rain. I think you could make a case that chaos and authoritarian regimes flourish after an occupying power vacates, or is forced out of, a geographical area. But this is tough to prove. Given the scholarly difficulty of tracking down the history of every individual shifting country on the list, I didn’t try to quantify my conclusion. I’d have liked to see graphed breakouts by region, and more by century or historical period, but in most cases it is easy enough to see those patterns in the Conservapedia listing. You’ll find a graph of my “how long do they last?” results below. FRANCE: STRIFE WITH SPECULATORS – Real estate prices on the Mediterranean island of Corsica are extortionate. A little cottage can set you back 400,000 euros. The Corsican authorities have passed a law requiring anyone who wants to buy a house there to have lived on the island for at least 5 years. The move is a response to people from mainland France and abroad buying up properties as holiday homes, causing prices to spiral. As a result, many Corsicans can no longer afford to buy property there. But now a few communities are fighting back, and threatening to enforce pre-emption rights – including the village of Cuttoli near Ajaccio, the birthplace of Napoleon. SAN FRANCISCO TENDERLOIN PROTESTERS RALLY AGAINST TENANT EVICTIONS: The Tenderloin is the seediest, highest-crime district in The City. Arrests do little to curb assaults, robbery and drug trafficking. Yet a 1 bedroom studio, a 475 square feet apartment, lists for $2295 monthly. Residents protest being evicted and displaced as wealthy yuppies renovate whole districts at bargain prices. In the Middle Ages, when wealthy power elite wanted a piece of property, they simply used armies to take it. Today, they use “perfectly legal” economic strong-arm tactics to force existing residents out. Landlords, police and sheriffs handle all that messy, unseemly business of serving eviction notices, warrants and arrests. In the end, the wealthy get what they want, and displaced residents are forced to try to find someplace else to live, else join the growing ranks of homeless. I don’t have the answers. But we are going to have to find them. It seems obvious that improving a neighborhood and simply taking it over are two different things. Increasingly, this problem is going to become a problem of good government – and governance. We’re being pushed back closer and closer to the feudal economy. Alex on How Long Do Dictators Last? Bruce Jensen on How Long Do Dictators Last?